When you're feeling down there're nothing better than friends that cheer you up and something new to learn. In the picture there's also a corner of my sampler started after the class of Sardinian Bosa filet. I've almost finished the hanky with daisy chains and I've started a new tatting project for Christmas. That it isn't the conical helix, that's beyond my capacity, not for this year, at least! A friend I met up with in England had also been to Sardinia recently and found it inspirational. 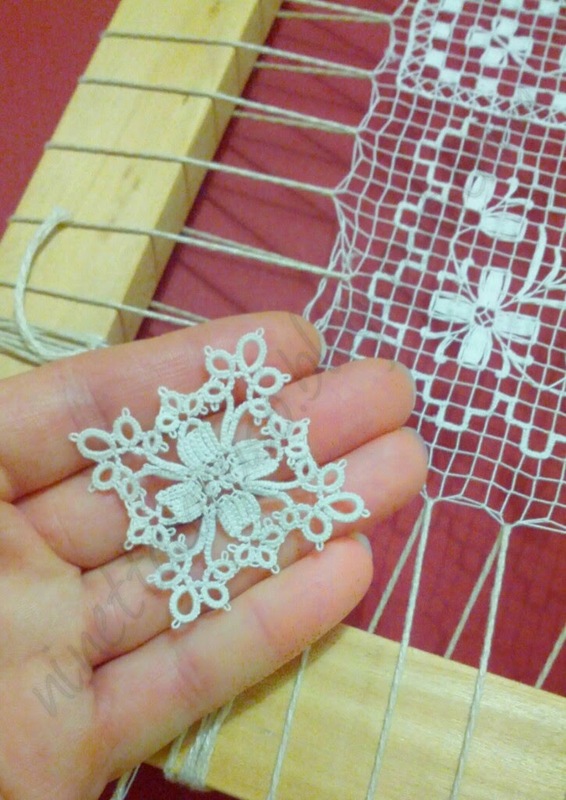 I love the way you've translated the sampler into tatting, wonderful! What a Gorgeous square ! Great use of block tatting, Ninetta. Love this square ... lovely. Questa piccola piastra al chiacchierino è stupenda! Da lasciare col fiato in sospeso, bravissima! Thank you all so much! I forgot to write that the thread is dmc size 70. I'm going to try it again with size 80 and coloured. Love all your work and the tatting wonderful to see your talent and want want to try this square! The content of this quality is really hard to find.